Last year at TechCrunch Disrupt, a little company named Qwiki made their debut. The web service instantly visualizes search queries into unique informational videos. For instance a search for “Skatter Tech” will readout information from our Wikipedia pages with collages of photos floating across the screen. Searching for a more common term such as “New York City” even brings up complementary animations, maps, and videos of the city during narrations. Qwiki describes themselves as an “information experience” and that is definitely an appropriate fit. The current alpha includes nearly 3 million reference terms including famous people and places. Buzz about the company skyrocketed last week as news about an $8 million round in funding from Facebook co-founder Eduardo Saverin and YouTube founder Jawed Karim hit the web. Viewers can pause, play, and resume generated videos at their own pace. The latest alpha brought the ability to embed, email, and share Qwiki content. Related terms appear once a video finishes playing. Qwiki even makes it easy to get additional information about the context or source of any part of an “informational video” by simply clicking on a visual. 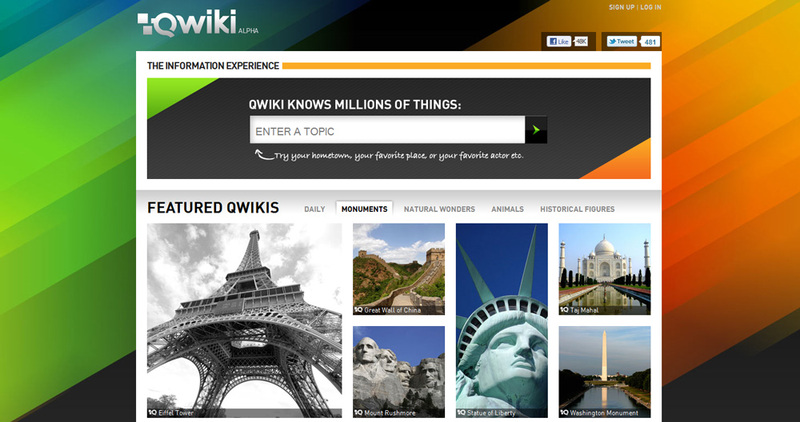 Qwiki lets users manually improve video by accepting suggestions for improvements. The company also boasts that Qwiki will soon offer a way to turn data about your Facebook friends into informational videos as well. I am also excited to see this technology to make its way into mobile devices. As mentioned during the initial Disrupt demo, this would be a great technology for daily briefings about calendar appointments, news, weather, and much more. Hopefully some improvements to the existing voice engine will make things sound more natural by then.